How long has your League been playing Stormfall? The Deutschland III League has been playing for 2 ½ years now. But the players already knew each other from the mother League, Deutschland. In Deutschland, we got to know each other and helped build ourselves up. The Leagues Deutschland II and Deutschland III were supposed to be the development League for Deutschland. Unfortunately, due to some discrepancies, contact with the Marshals of the Leagues Deutschland and Deutschland II have broken off. But gradually, the members migrated to Deutschland III, and the League started to grow. The Leagues Deutschland and Deutschland II don’t exist anymore. Of course, the thought of changing our League and leaving Deutschland occurred to us, but that would not be us. We are Deutschland III, and we are proud of each of our players. Thus, most of us have spent the better part of 4 years together, some even as many as 5, and we know each other forever. We always say we are like a big family and we take care of ourselves. But also new members are welcome. And every player has a say in our decisions. The opinion of the League is very important to us. Therefore, all members are asked for input on big issues. How often do you organize gatherings? That was our first gathering. Just after playing for so many years and having fun together in Teamspeak, we once said that we need to meet. That was only for that reason, but I liked the idea a lot, and considerations for how we could organize and plan the gathering came to my mind. Then I discussed this with Karl Ehlen, and then we nailed down some specifics. The request to all players went out, and we started to plan. The date was quickly set, and in 2 months we had planned everything through. The day of the meeting arrived, and it was a breathtaking weekend. It was like seeing old friends again after ages. We were all in each other's arms and happy to see each other. How many players took part in the gatherings? 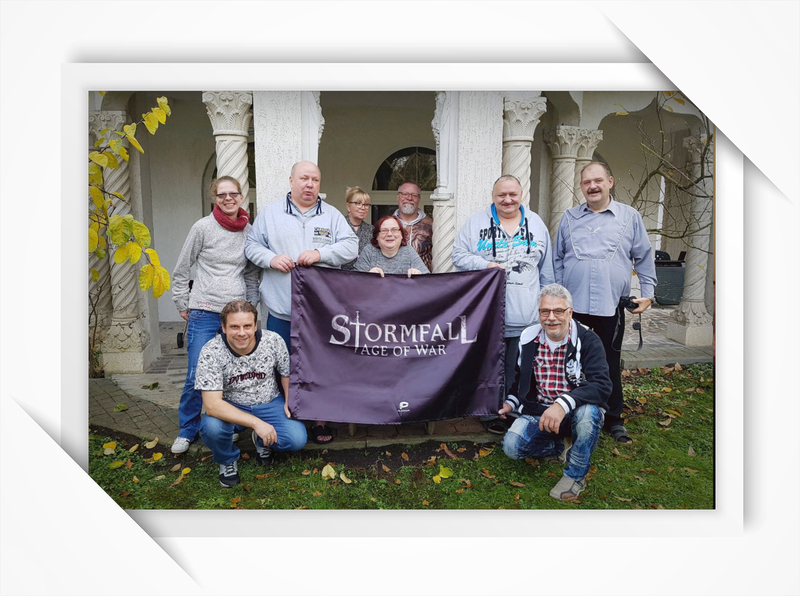 This was the first gathering, and there were 10 people from Austria and Germany. I think others wanted to wait and see how the others found it. That's usually the case that somebody always starts and then it gets more and more popular. It is like a drop which forms small waves that then get bigger. Who organizes your gatherings? How much time does it take to fully plan a gathering? Karl Ehlen and I organized the gathering. We were planning this gathering for about two months. You should really plan for 2 - 3 months so that you could really plan everything in peace. There are too many things to consider. Do you like the flag we sent you? The flag is not bad. The lettering and the fabric is awesome. However, many of the participants thought I had the red flag with the head. But we made our flag a little more personal. Everyone who attended the gathering signed on it. So we can expect more gatherings from the “Deutschland III” in the future? We will definitely repeat this gathering, and most likely we will start doing it regularly, meaning that we might start meeting twice a year. But we were already aware on the first evening that there will be the next meeting. It was like long-time friends meeting again after ages apart. What kind of suggestions can you give to other players who want to organize a gathering? One, you should be aware of how the gathering is structured. For example, you must decide if you are gathering in the afternoon and driving home in the evening or overnight, or if guests are staying overnight. If it is overnight, you should leave enough time for planning accommodations. It is always good if you write a letter to the League and provide for a period for the guests to confirm they’re coming. When you know who and how many are coming, and from where, you can start planning where the meeting will take place. We chose Hannover because it was the most central location for all participants. After determining the place where the meeting takes place, you can start looking for suitable accommodation. And as always give yourself plenty of time. As the host, it’s your job to make sure everyone is accommodated. I think it is important that you ask the participants whether there are any special needs or issues to help out with. For example, health problems meant some of our participants could not climb stairs very well. Therefore, it was important that we found an accommodation that is rather level and has almost no stairs. It must also be determined whether your group will feed yourselves, cook, and eat as a group, or you go to a restaurant. If you’re cooking, then you need to figure out who buys, who cooks, who cleans, and so forth. Also, make sure to ask if there are allergies or intolerances on which should be respected. You do not want to have a meeting where the ambulance comes because someone is in anaphylactic shock. It is important to clarify in advance what the costs are and how to do it best. Is there a treasurer who manages the money? If not the organizer, someone should have that job. At least that's what we did. What should also be considered is how the participants come to the meeting point. Can you form a carpool? Who comes by train, car or plane? Can you pick people up from the train station or airport? Don’t forget about public transport or taxis. On-site, you can also just look at the rooms and decide who might share a room with whom, if not everyone wants a single room. Of course, that's all a question of cost. It is important that you really take enough time for planning. Check in with the participants every week and talk about the state of affairs. That way you can make sure that even if you do not think of something, the others will point it out. The most important thing is, just have fun. Rejoice and just enjoy it. I say a gathering like this is really a great thing and everyone should really do it once. It's just great to meet players that you've been playing with for so many years.